The British Society of Scientific Glassblowers was founded in 1960 for the benefit of those engaged in scientific glassblowing and its associated professions, and to uphold and further the status of scientific glassblowers .Scientific glassblowers are charged with manufacturing laboratory equipment in glass, using glass rods, tubes and prefabricated components. Although the Society is primarily for scientific glassblowers, we encourage anyone with an interest in glass working to join – glass as a material holds an interest for many, and glassworkers provide a huge range of products, from glass beads and jewellery, to paperweights, decorative and practical vessels of every shape, size and colour, and sculpture intended for purely aesthetic effect. Were it not for these artists and craftsmen throughout history, scientific glassblowing would not exist as a craft. The Society holds a quite sizeable library, to which members have free access. Scientific glassblowing is a specialty field of glass blowing used in industry, science, art and design used in research and production. 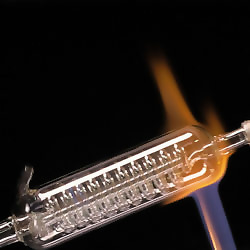 Scientific glassblowing has been used in chemical, pharmaceutical, electronic and physics research including Galileo’s thermometer, Thomas Edison’s light bulb, and vacuum tubes used in early radio, TV and computers. More recently, the field has helped advance fiber optics, lasers, atomic and subatomic particle research, advanced communications development and semiconductors. The field combined hand skills using lathes and torches with modern computer assisted furnaces, diamond grinding and lapping machines, lasers and ultra-sonic mills.